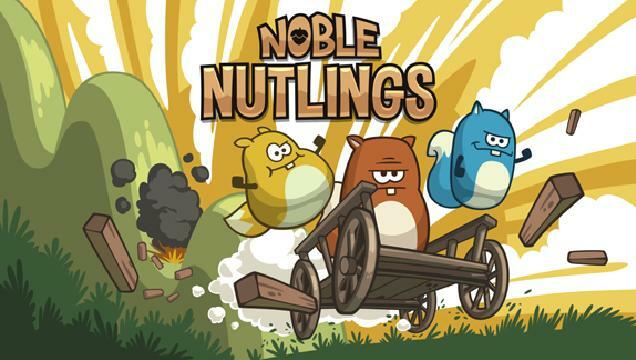 When you first glance at a few screen shots of Noble Nutlings I am sure that a great many of you will think that you are looking at some kind of spin off from Bad Piggies. And there is a good reason for that because Noble Nutlings is a game that was made by some people who worked at Rovio. This is a great looking game. The fact that it does have some of the team that worked on Angry Birds can clearly be seen in the games presentation. You would swear that this was a game that was made by Rovio. The characters all look great. They manage to give each one of these squirrels there own little personality without having them actually say a thing. The way this game plays is like a more fun version of Bad Piggies. Now I am not saying Bad Piggies was a bad game, but it certainly was a tough nut to crack (sorry for that bad pun) Anyway Noble Nutlings is a game that plays very similar to Bad Piggies. At the start of a level you are required to build a kart. You have a few different things at your disposal to build your kart from, and it is up to you to figure out what to use and where to put it so that your kart can finish the level and not tip over. You have some control over your kart once a level starts. You can tilt the device and use an accelerator. So you do have a great deal more control than what was on offer with Bad Piggies and because of this extra control it makes the game more fun and accessible to play. Throughout a level you pick up acorns which can be used to get coins which I am sure you have guessed can be used to buy more parts for building a better kart. Now you can spend some real money if you want, but I was able to play the game without ever spending a penny. But still for people who want to be able to build the ultimate kart then the option to go crazy in the in game store is always there. I think the fact that the game is more forgiving and gives you more control over what Bad Piggies offered is what is going to keep people coming back to this game. There were some levels on Bad Piggies that must have took me around 20 tries to beat. Each one making more frustrated. While there are frustrating moments in Noble Nutlings it never gets to the point where you throw a tantrum and turn the iPad off (well that is what my daughter did) I think that this is a great little game and I have a feeling it could be the first in a long running series. If you have kids who loved the idea of Bad Piggies, but could not play the game very well then this is a fantastic alternative.